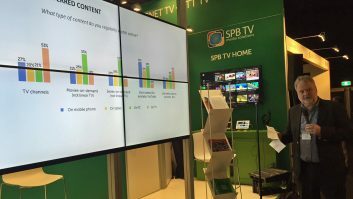 Zenterio has announced that Greek telecoms provider OTE Group is launching an advanced set-top box (STB) called EUROBOX for its COSMOTE TV pay-TV service. With the EUROBOX powered by Zenterio OS, COSMOTE TV is able to support internet-delivered, on-demand content in addition to live content. By separating software from hardware, Zenterio OS reduces integration time and enables compatibility with connected devices. It also eliminates the use of external hardware modules, enabling COSMOTE TV to quickly introduce the advanced services to its customers. A new feature that COSMOTE TV is offering with its EUROBOX is the ability to use a Smart Remote application. This enables users to control the COSMOTE TV STBs from iOS and Android devices via a customised user interface. With the application, viewers can navigate through the program guide and the TV menus, change the channel, launch replay TV events, and rent VoD content to play directly on their TV without having to stop watching the current program. As part of the upgrade with Zenterio OS, COSMOTE TV has also enhanced its VoD store available to subscribers. In addition, the STB is integrated with an external USB Wi-Fi adapter to enable connectivity to VoD and catch-up TV services without the need for an Ethernet cable. It is equipped with a built-in DVB-T2 tuner that allows viewers to add digital terrestrial TV programs to the list of channels without the need for an external adapter.